The Port of Amsterdam is about to get its first floating bunkering station for liquefied natural gas (LNG). 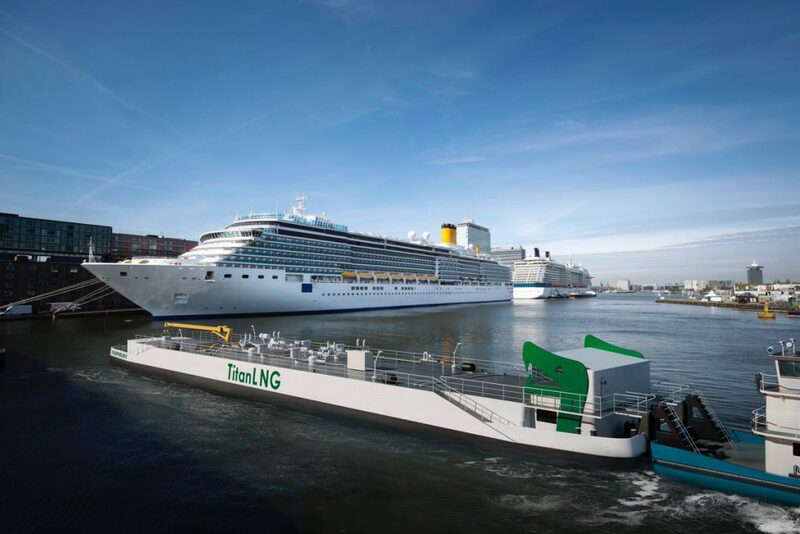 Titan LNG, a supplier of LNG to the marine and industrial markets in North West Europe, has contracted the manufacturing consortium for its FlexFueler001-Europe’s first LNG bunkering pontoon. The hiring of the consortium comes following the principal design approval for the concept obtained from Bureau Veritas. Smaller seagoing vessels and cruise ships are set to benefit from the bunkering station by 2019. Investments costs are estimated to be worth EUR 9 million (USD 10.4 million), and the project has been financed with support from the Province of North-Holland. The pontoon will have the ability to deliver LNG in a range from 30 to 600 cbm per hour and will have two 380 cbm tanks, with the option of adding two more tanks. Michael Schaap, commercial director marine of Titan LNG, comments “Due to the substantial increase in upcoming demand for LNG as a bunker fuel in the region, we had the opportunity to outfit the pontoon directly with 4 tanks. It was an easy trade-off between becoming operational slightly deferred and reaching maximum capacity of 1480 cbm from the start directly." “We identified LNG as an important development for the necessary emission improvements in the shipping. To us, the FlexFueler is the logical last mile solution for in-port operations. It copies the usual modus of operations in the existing bunkering market, paramount for adoption by ship owners. Furthermore, heading shipbuilding projects, acting as the main contractor and taking full responsibility for the complete ship, also fits our full-service philosophy,” Rinus Kooiman, general manager of the Kooiman Marine Group said. “Over the last months, we have worked very closely with Titan’s engineers in order to design a compliant and practical LNG bunkering system and added our maritime piping experience to the initial process design. We cannot wait to bring the system into operation,” Niek Koops, general manager of Marine Services Noord, added. The port plans to invest EUR 10 million until 2021 into its infrastructure, including LNG bunkering facilities and ship-to-shore power, to achieve these objectives. Also, the existing incentive programme for promoting cleaner shipping will be expanded further and LNG-fuelled vessels will receive additional discount on port dues.